Hello and welcome to the second group post for the October Papertrey Ink Release! The new products you are seeing here will be available in the store at Papertrey Ink on October 15th at 10:00 EST! 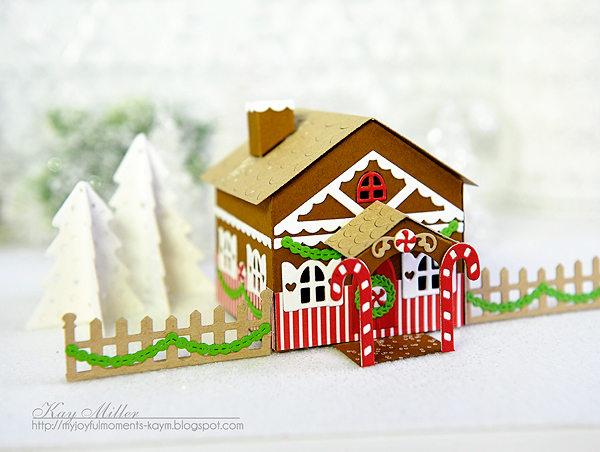 Today I am sharing my little gingerbread house that I created with Betsy's newest addition to the Tiny Town series, Tiny Town: Gingerbread along with Tiny Town: Holiday Yard! I was so excited about this! 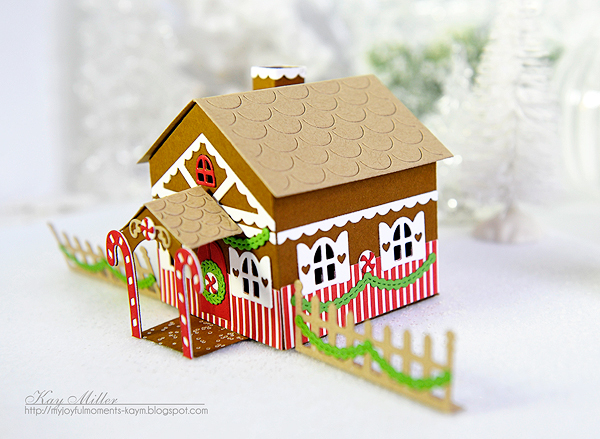 I love little houses and gingerbread ones are my favorite! 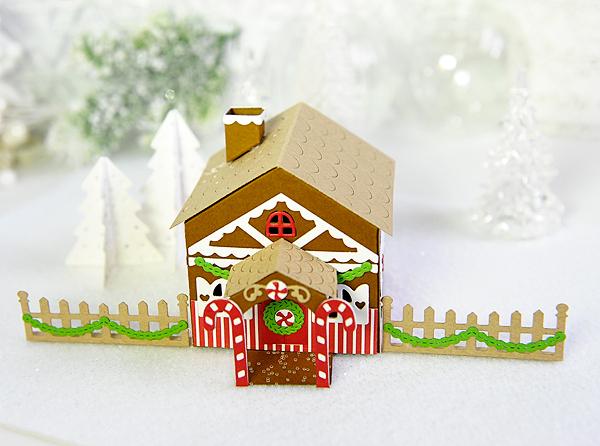 These dies have all the little details you need to turn your basic Tiny Town House into a fun and festive Holiday decoration! Oh my goodness isn't that darling! I just love the way it turned out! I cut the basic house out of Cocoa Bean card stock and the roof out of Classic Kraft. I used a strip of Pure Poppy + White striped paper to go around the bottom of the house. The green garland comes with the Holiday Yard dies and they fit the fence, but I thought the house needed a little bit of greenery too. I also added the wreath on the door. The trees from the Holiday Yard dies are flat, but I cut four each of the small and the larger one and scored them down the center, then glued them all together to create a 3 dimensional tree. I love the candy canes and the little peppermint candies! They add just the perfect touch! 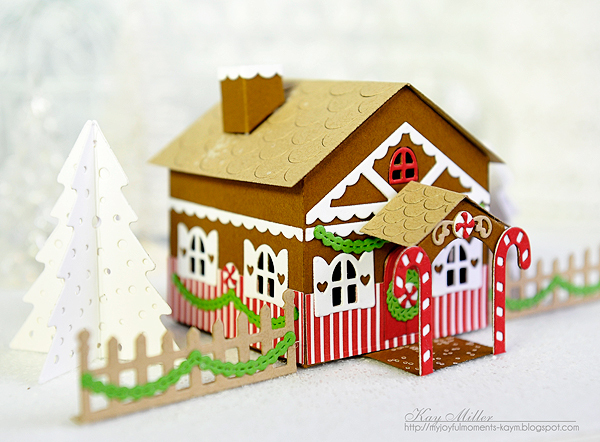 Now that I have one of these under my belt, I want to make several more to add to my little Christmas village! My mind is already churning with ideas for different colors and ways to use these fun new dies! Thanks so much for stopping by! I'll be back tomorrow with another look at some of the fun new products coming to Papertrey Ink October 15 at 10:00 EST! Thank you, Kay for getting me into the holiday mood. So so sweet! oh so sweet and a lot of fun! Just noticed the trees! They are really cool too! So cute Kay! Great gingerbread house project! I can't wait to get this die set! 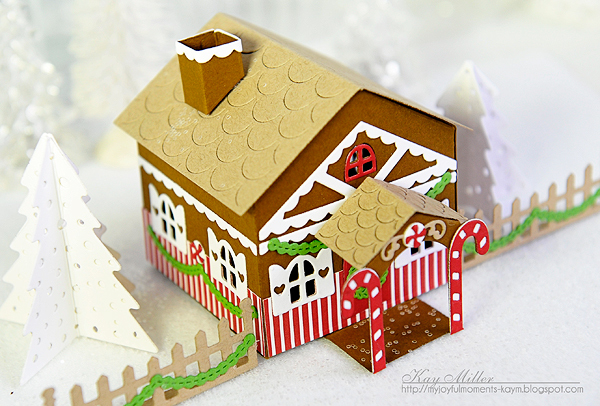 So much sweetness on your gingerbread house, Kay, can almost smell the spices! 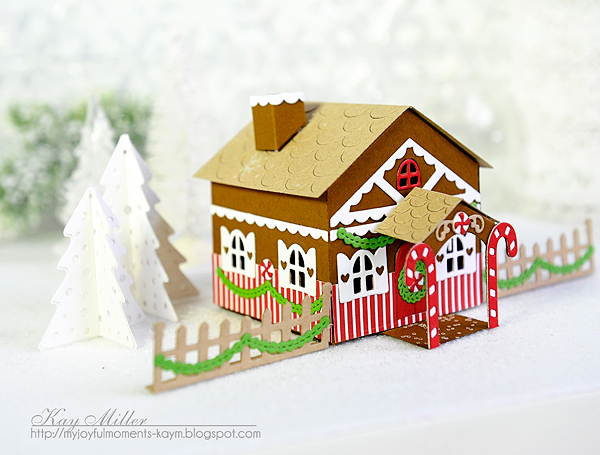 Love the candy cane posts, and that adorable green garland. Amazing house, Kay, the detail is just so stunning! This is just so unbelievably adorable!! What a beautiful job you did. Very inspiring! This is incredibly adorable, Kay!!! Simply adorable. Getting the kids involved making these would make a great winter evening. That's just the sweetest little Gingerbread House ever!!! Love all the details and pretty Christmas colors. Great project! Perfect!!! Are you hearing my squeals and screams all the way to your house??? Your rendition is DELICIOUS and Adorable! Wait I hear another word coming up...... where it comes......ADORALICIOUS!!! UFF! that took a lot of hard labor on my part! I just came from Betsy's blog and I commented that it was her fault for my finances being askew, but since I am an ecumenical blamer, you my darling friend are going to carry the responsibility on your shoulders also! And I say it with all the love that I have in my heart for you! Who needs enemies when you have friends as me....right? Oh Kay!! This is just ADORABLE!!!! This is precious!! What an adorable scene and a great new product from PTI. Love the polk dot roof!! Yes it is absolutely darling, Kay! I love the decorated fence and pretty white trees! I just wanted to come back and say, I bet you are enjoying your bit of a break and enjoying time to play with all the stamps you have. I was just thinking of you .